The CAD D19 is a compact dynamic microphone designed for snare drum. It is built with an integrated drum rim clamp. The D19 has a supercardioid polar pattern and narrow frequency response: 90–14,000 Hz. The frequency response is relatively flat from 200–2,000 Hz then rises nearly 10dB from 4kHz to 10kHz. 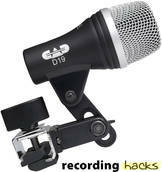 The D19 is sold as part of the Stage 4 and Stage 7 drum mic bundles. The CAD Audio D19 is also known as: D-19.